The passionfruit vine below is 1 year old and full of passionfruits. 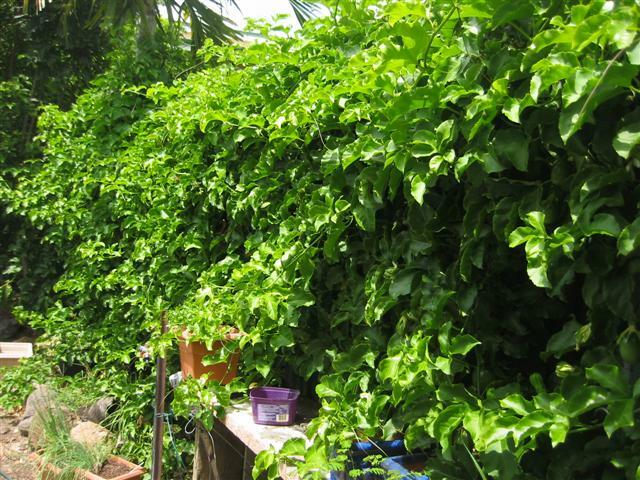 Simply by placing a trellace along the fence so that it can grow along the passionfruit will flourish in hot environments such as Queensland. There would at least be a hundred passionfruit ripening on this vine. I find that the large purple flowers appear for a day or two and then they form the fruit. You do need to be patient with the fruit because after appearing it takes a couple of months before they turn from green to purple. This passionfruit is a Passionfruit - Panama Red. hi, i have a passionfruit tree which is about 1 year old. it is full of flowers but they have been on for a few weeks and the fruit still isnt growing from them. why would this be??? If you can give a picture of your passionfruit vine and perhaps your flowers as well. An idea off the top of my head is that you may have a pollination problem. But would be great to know more details. However I would wait a bit longer then a few weeks for the passionfruit to start forming. Hi, we have 3 great vines full of flowers and now fruit . Fruit is green and firm, well it was, now some of the older/first ones to set are getting soft! help what is the problem or is this normal? Bill this is quite normal. What happens is the passionfruit overcompensate it's ability to carry all the fruit. It is good to keep the water up to it and what I do is the ones that are shriveling up I pick off and throw away that way the vine can put more energy into the ones it is choosing to carry through to copmletion. Another thing I heard was if you can open up the passionfruit and see if there are any seeds inside. If there are none then you have a pollination issue. 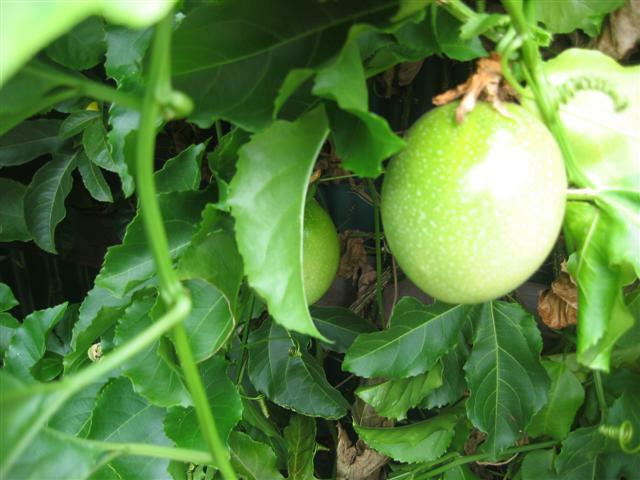 We have a very healthy passion fruit vine (Port Macquarie NSW) and it has been suggested that you wait for the ripened fruit to drop to the ground rather than picking from the vine. Can you grow a passion fruit in a pot? I am prety sure that you can grow them in pots. Here is a blog entry where someone was growing them in big containers. I have a vine that is 6 months old and grew beautifully and quickly - had flowers but no fruit. It now seems to be shedding its leaves starting at the stem. The first 2 meters of the vine are now bare and it seems to be spreading across the vine. The far end of the vine is still growing well and looks healthy. What is going on?? What is the best way to bring on flowers. I heard potash is good? But l cannt get any. Also how do passionfruit go in the snow I live in Osaka Japan the vine is now one year old? my vine is 12 months old. i have flowers but as soon as they close they fall off. any clues ? I have an almost 3 year old passionfruit tree in melbourne and every summer, flowers appear, but i haven't had any fruit yet. does a passionfruit tree need a male and female plant to germinate for fruit? I was wondering what is the best type of trellis for a passionfruit? What kind of wire, what height and width? Hi, I built a couple of small planting boxes around the supports of my patio. Planted a passionfruit in each, built a trellis out of plastic wire, and bingo, I have two vigorous vines that are full of fruit in less than a year. I keep the water up to them and regularly top up the soil with compost and manure. I'll build a trellis along my back fence and plant some more. I live in Darwin, australia, and i too have a passionfruit vine. It's beautiful and green and covered in fruit. Potash, potash and more potash. That is all I have used, with a bit of seasol and it flowers beautifully and is covered in fruit. It's also known as sulfate of potash. I live in Melbourne, Australia and have a now 1 year old passionfruit tree with an abundance of fruit on it. It started fruiting during our summer (December) and continued right through to April this year. My question is when will they finally all ripen - I have the occasional ffruit fall and ripen in my fruit bowl - but there must be hundreds of plump green fruit still on the vine during the depths of our winter. Is this normal? I posted this incorrectly under another post (pruning passionfruit) so maybe I will get a bit more help here. I put in a small Panama red passionfruit vine about 15 months ago but as of yet there is still no sign of flowers or fruit. It is at the back of my herb garden on my western wall. I think it really only gets the morning sun. Should I expect blossoms any time soon. Thanks for any help! I have three passion fruit vines with scores of flowers. Every flower displays its beauty for a number of days, then drops off, leaving an empty 'shell'. Not one passion fruit has come into existence. I have watered the plants religiously, and have fed them blood 'n bone plus chicken manure. What have I done wrong...? 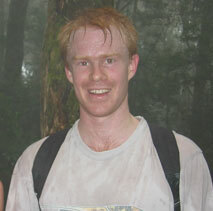 I am an Australian and live in Rome. I brought back seeds from Aust (yellow type) and planted them in a pot 3 years ago. The vines have grown well and I had 2 flowers this year for the first time, but wind blew them away. Since them, nothing has appeared. Is the problem the type of seeds, pot or the cold winter we have at the moment? Can anyone help? My mUm in Qld has had a vine for years and years which continues to produce heaps of fruit with no fertilising etc. from her at all. I have buoght a couple of passionfruit plants from Bunni December 2009. They are panama. And now there so many flowers. Is it right season for flowering? I am living in Brisbane. I am worried this is not right season for flowering, it may affect next year harvest? Please help me. We have just uploaded a video on pollinating passionfruit. I've got a beautiful passionfruit vine that I planted about 6 months ago... It grew fantastically and has heaps and heaps of fruit(green). Just wondering if they will actually ripen? I live in southern New Jersey and to my surprise I discovered my passionfruit vine growing totally on its own. I noticed the unusual leaf formation on the vine and decided not to pull it out and to my complete surprise after awhile it started to flower and thats when i figured out what it was. I erected a sizeable trellis and it did well but only set two dissapointing fruit. However this year flowers and fruit everywhere. Its such a incredible gift, I can get over it, I'm constantly staring at it in awe. The strange part that I find is that New Jersey can get pretty cold especially last winter. After going over several blogs I keep see potash being mentioned. the area where it's planted just happened to be an old roadway where back in the 1800s, it was an access road for hauling ash back from coal deliveries to the lumber and coal company which once own by the original owner of my home. It's also makes a great display area in the spring for all my spring or Easter bulbs. It's great to see such a great interest by so many people. One question I have is I have dozens and dozens of fruit but nothing seems to ripening, whats the normal time frame it takes to ripen? I have had my vine for nine months. After planting it in the ground in a sunny spot sheltered from the wind I thought it would take off but it was a bit slow to do so. At first it just grew and grew with no flowers in sight. At the end of the summer (August) I was about to pull it and plant it elsewhere as a shrub/boarder filler but all of a sudden it exploded with flowers. Not all of the flowers bared fruit but there are now five little passion fruits ripening away. I did not use potash but I did give it lots of water. As a trellis I attached chicken wire to two pieces of 2x4 and mounted it to the wall just above the plant. It did not take long at all for the vine's fingers to find it and take over. It is now as big as I would like it to be so I have been trimming it back to maintain it and it is not fickle.